Ted Bodner, hosted by the USDA-NRCS PLANTS Database.James H. Miller and Karl V. Miller. 2005. Forest plants of the southeast and their wildlife uses. University of Georgia Press., Athens. (Accessed 5/2014). 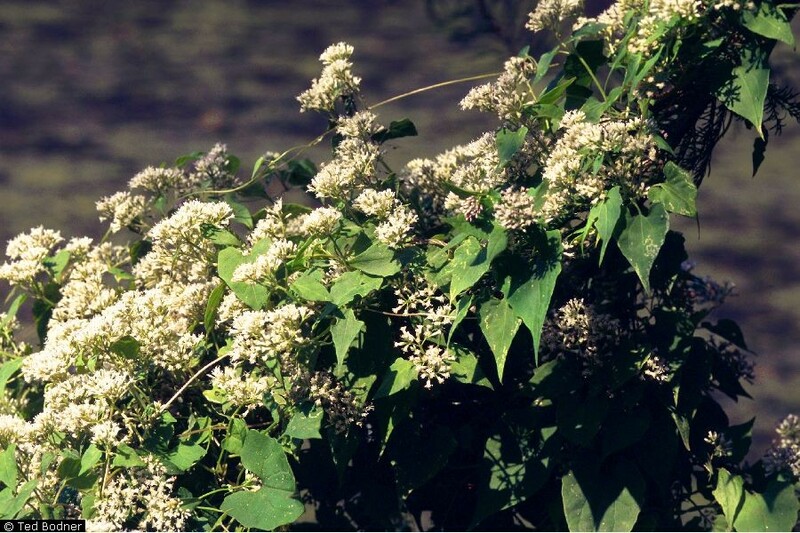 Mikania scandens is a perennial, herbaceous vine; stems twining, to 5 m long, usually hairy, roots fleshy. Leaves opposite, stalked, blade 3-14 cm long, 2-8 cm wide, base heart-shaped, tip pointed, base deeply lobed, veins palmate, margin entire to few-toothed. Flowers dull pinkish, 4 per head, all radially symmetrical (discoid), no rays, basal bracts (involucre) 4, 0.4-0.5 cm long; inflorescence of flat-topped clusters; blooming July-Oct.
Fruit dry, one-seeded achenes, about 0.2 cm long, white-plumed; wind dispersed in autumn. Habitat: Wet, open areas, marshes. Soil pH 5.7-7.5 (USDA 2005). Notes: Occasionally aggressive under some conditions. Possibly in response to high nutrient loads or continued disturbance (M. Gargiullo personal observation).